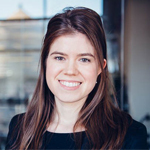 Christina Copeland leads CDP’s water work in North America, engaging with companies to improve their disclosure, internal governance and robustness of their water targets and actions in the communities where they operate. A frequent public speaker, she also works on the topic of collective action and the importance of convening government entities, local communities, companies, investors, and civil society organizations to address and mitigate shared water challenges at a local level. Prior to joining the water security team, she led the organization’s corporate climate change and water disclosure work for Materials companies and executed CDP’s water membership program in the US and Canada. She was named to the GreenBiz 2016 “30 under 30” list and serves on the Board of Advisors for the Yale University Dwight Hall Socially Responsible Investment Fund. Before coming to CDP, Christina worked in Mumbai, India doing corporate sustainability consulting for Tata Consultancy Services.